Last week we explored magic, design and playing cards in Carded. This week we talk with three designers about three decks the magic world holds in high regard. Last up: Lee McKenzie and his Infinity deck from Ellusionist. After the Q&A, designer Tim Silva provides on-deck commentary. As a passionate student of magic as well as a graphic designer, I dreamed of designing my very own deck one day. In 2007, inspired by Ellusionist, one of the leading online magic companies who had started to step out into custom cards, I finally started work on a concept that I thought would change the game, I was so excited. I had some samples printed and sent them off to the CEO of the magic company to see if he’d like to add them to his product line. I was incredibly nervous awaiting his response, but the day came, I got an email and he loved them! Soon I became their lead playing card designer based off the work I sent him. I was hired to create the company’s first, fully custom deck called Arcane, which was soon followed by Infinity and more. What were the parameters you were given when designing the Infinity deck? The actual concept is something I came up with while developing ideas for the previous deck, Arcane. The idea was to keep developing that theme until we hit something that really sings. As such, the parameters are very loose and they gave me full confidence to run with it and see what I could do. The result was a very old-world, dark and mystical design conveying the theme of timeless magic from the past and into the future. A very fantastical vibe. The general feeling of the deck was already established from a previous idea I developed. The next step was to really try to concrete what was a very elusive concept to realize. Time. Also, establishing a running style and overall theme in which to do that. When cards are used for tricks, cardistry and flourishing, there are always things you have to consider in the design to really give that audience something that sits well with them and enhances their art. For example, the top left corners of the backs are always going to be visible in an array of fan-based flourishes, so creating a really interesting four corners on the back helps them to stand out when those moves are performed. With Infinity, there’s a little cherub’s face with wings on each side which creates a very organic and appealing corner style and looks great when fanned. Introducing more flowing, natural borders is something I try to do a lot to help put more character and flair into the edges so when you spread them they look real tasty. For tricks, there’s the classic joker card reveal which is something a magician can use to reveal the identity of a spectators card printed right onto the card. For Infinity, which is actually written in the banner on the joker, it allows the performer to “morph” the word into the name of a selected card. It looks incredible and it’s something that’s put to work at the design stage. It’s not a new concept but trying to create an ever-increasing original way to present it is a great challenge. Beyond the obvious space limitations, what design challenges and joys does a deck of cards present that sets the job apart from other jobs? Anything that you find ties the job to other, more traditional design jobs? 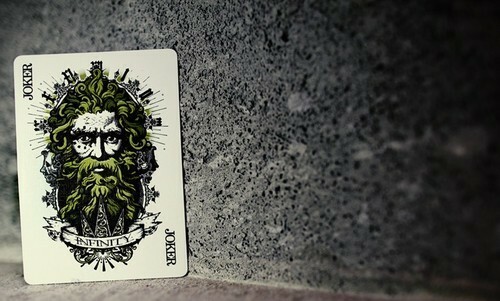 I liken the design of a deck to an art poster. Obviously the canvas is much smaller, but when you see it from a large poster-like perspective it can really help open up the possibilities of what stories you can tell and what detail can be achieved in such a small space. I love the challenge of designing a deck, especially because it’s something I use as a magician too. So much so, that I’ve moved away from freelance design and have just launched my own playing card company, Kings & Crooks. We’ve just had a successful Kickstarter project for the very first deck of my own called Empire. It was received really well and I’m so excited about the new decks coming next. Lee funded his Empire deck via Kickstarter. From a love of magic spanning over 20 years now, the evidence of a “misspent” childhood is clear to see when I get a deck of cards in my hands. I love performing tricks for people and even the solitude of practising sleights and techniques. It’s actually very soothing and meditative. My favorite card game is Texas Hold’em, not that I use any “moves” during play to sway the odds in my favor. Honestly. Find Lee at Dribbble, on Twitter, and at Kings & Crooks. Find the Infinity Deck at Ellusionist. Lee custom-designed a red Ace of Spades for the Infinity deck. 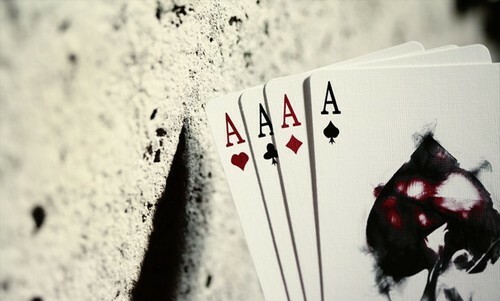 Photo courtesy Ellusionist.